ISLAMABAD — Afghanistan and Pakistan officially are now the only two nations across the globe to have reported wild polio virus cases so far this year, though the numbers of cases have declined to historic lows. Armed conflicts, deadly attacks on polio vaccinators and instances such as lack of administrative oversight while reaching marginalized populations and anti-vaccine propaganda by Islamists are blamed for the failure to eradicate the crippling disease from Pakistan and Afghanistan. “As of 9 November 2017, there are 14 cases of wild polio virus globally — nine in Afghanistan and five in Pakistan — the lowest number recorded in history,” UNICEF reported Monday. Pakistani officials reported 300 polio cases in 2014 and Afghan cases have gradually declined from 80 in 2011. While the two countries have taken significant measures to overcome domestic challenges facing national immunization campaigns, UNICEF officials credit ongoing coordination between polio teams of Afghanistan and Pakistan for reducing cross-border transmission of the devastating disease. A Kabul-based UNICEF spokesman, Kamal Shah, acknowledged political tensions between the two countries are not hampering counter-polio efforts. He says polio teams on both sides make sure children among thousands of daily border crossers get vaccinated. “There is a good cooperation going on and we try our best to synchronize the dates of our [polio vaccination] campaigns. So, the efforts and the cooperation between the two countries is having a big hand in reducing the number of polio cases [on both sides],” Shah told VOA. Divided families and more than three million Afghan refugees in Pakistan are mostly among daily crossers and serve as carriers of the virus, officials say. Last week, Afghanistan’s ninth case of the year was confirmed in an eastern border region, with the virus linked to transmission that had occurred earlier in the year across the border in the Pakistani city of Peshawar, according to UNICEF. Pakistan and Afghanistan share a 2,600-kilometer largely porous border. However, there are only two crossings, Torkham and Chaman, that Pakistani authorities allow for visitors to travel in either direction. Shah says most of the recently reported polio virus cases have been transmitted through the Chaman crossing, prompting officials to focus vaccination efforts on the adjoining Afghan border town of Spin Boldak. “[E]specially in 2017, most of the cases we have, the genetic link of the virus is linked with a polio virus in Baluchistan. 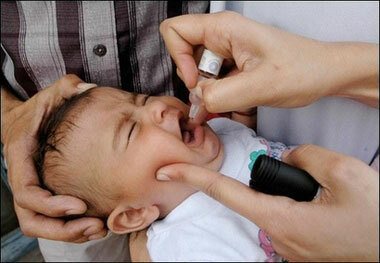 That is why Spin Boldak is called the epicenter of polio in the region,” he noted. The southwestern Pakistani border province of Baluchistan is where Chaman crossing is located. UNICEF’s Shah explained that despite intensified hostilities in Afghanistan, anti-polio efforts are effectively bringing down the number of cases in the country because vaccinators are able to conduct campaigns even in areas controlled by the Taliban insurgency. “In all areas, which are under the government or the areas which are under the control of anti-government elements, the polio program is implemented in those areas as well that is why we are successful to reduce the number of cases [in Afghanistan],” he noted.